The primary distinction is the ability of the PowerAIM to make readings in the presence of strong RF interference. The AIM4300 can tolerate up to 0.1 volt of stray RF at it's input, the PowerAIM120 can tolerate up to 25 volts, while the PowerAIM150 can tolerate stray RF up to 150 volts peak. 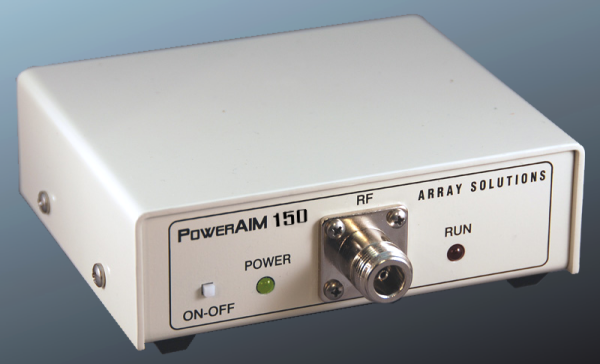 The PowerAIM150 software features include all the capability of the AIM4300 and it has additional features designed for commercial antenna system testing. The following example uses a PowerAIM120 to show how measurements can be made on a 160 meter vertical even when strong broadcast stations are only a few miles away. The disturbance due to each station extends only about 20KHz around the carrier. The PowerAIM150 is similar but it can handle much stronger interference levels than the PowerAIM120. A report on this evaluation study is available here.